Is there a Right Sauna Temperature? Some Like it Hot! The preferred sauna temperature for a good löyly differs among sauna enthusiasts. Some like it very hot including adding water to the sauna rocks to create steam while others may just prefer sweating in the dry heat. 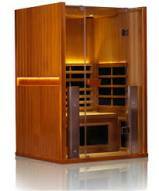 Still others who can’t tolerate high temperatures will prefer the lower and more comfortable heat of a far infrared sauna. 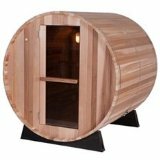 Assuming all aspects of the sauna room are designed and working correctly (heater rocks not packed too tight, the door not being opened frequently, proper wall insulation, optimum ceiling height, the exhaust vent closed, etc.) 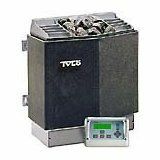 you can expect the sauna stove to operate at peak level giving you maximum heat when you want it. 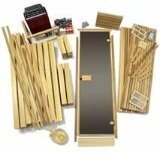 But the sauna temperature will still vary according to the type of sauna you desire and this is something you must consider before purchasing your kit or pre-built sauna. Time to Pre-Heat Up to 1 Hour Half an Hour 10 - 15 min. For a conventional sauna, the heat can be set to a high range of 160°F to 194°F. A typical bath will last about 15 minutes, with a cool down interval, followed by a second and possibly third sauna session. The relative humidity and high temperature will vary for a steam sauna depending on the amount of water splashed on the rocks, although the spike in temperature is very brief. An infrared sauna session generally lasts much longer, about 30 to 45 minutes, because the temperature is much lower and therefore more tolerable. This is because the infrared heat rays are directed to the body and not on the air in the room. Is There a “Right” Temperature? If you are wondering why Russians and Europeans can boast about having hotter temperatures in their saunas (above 200°F), it’s because while it is allowed on that side of the pond, it isn’t allowed in North America. Be aware that the maximum allowable sauna temperature in Canada and the United States is 194°F (90°C). These are C.S.A. and U.L. standards set back in 1982. At that time, it was also mandated that there must be a high-temperature limit switch within the sauna heater. The limit switch must shut down the heater under any abnormal operating condition and have a one-hour timer maximum on all residential sauna controls. There is no right or wrong sauna temperature as everyone has a different comfort level, and taking into account other factors such as age, pre-existing medical conditions, and overall health. Whatever your heat preference, you are buying a sauna in order to sweat. And the more you can sweat, the better your body can detox to rid itself of unwanted materials and improve general circulation.